Tired of the usual car deals? Get ready for the CaRAZIEST ride of your life then! Hyundai’s got your back with offers that makes buying a brand new Hyundai car easy peasy. 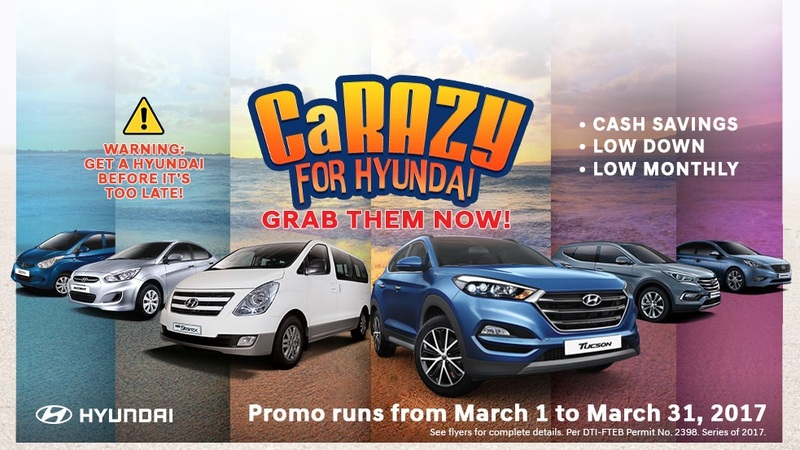 The “CaRAZY for Hyundai” promo allows you to save big bucks for as much as P100,000 – that is usable as cash discount, downpayment or low monthly subsidies. Your stressful daily drive can be more exciting for as low as P27k down if you get the tiny yet agile EON. Your adventure of a lifetime with the Tucson starts at P120k downpayment, while family bonding becomes tighter in a Grand Starex for as low as P167k downpayment. Other CaRAZY financing deals – including 0% interest payment terms are also available for other Hyundai models. These offers are made possible in partnership with BPI, Chinabank Savings, Eastwest Bank, May Bank, PNB, RCBC, Security Bank and BDO (Metro Manila only). The “CaRAZY for Hyundai” promo runs up to March 31, 2017 only, so rush to your nearest Hyundai dealership now! Most of all, acquiring a Hyundai goes beyond car purchase. You also get into an exclusive membership to the One Hyundai Family (a rewards program that provides freebies, discounts, and 24/7 nationwide roadside assistance) and Hyundai Cares (the 24/7 hotline dedicated to assisting both pre-sales and after-sales inquiries or concerns). For more details, visit hyundai.ph or facebook.com/hyundaiph.